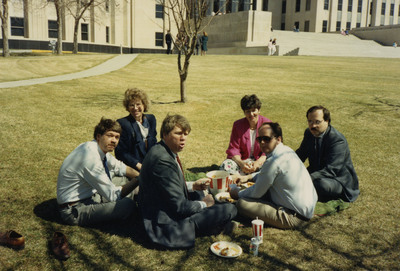 "Legislative Picnic at the State Capital"
A group of North Dakota legislators gather for a picnic on the grounds of the state capital in Bismarck. State Senator Wayne Stenehjem is seated at the far left, next to State Representative Rosemarie Myrdal. The remaining four individuals are unidentified. A Republican from Grand Forks, Wayne Stenehjem served in both the North Dakota House of Representatives and the North Dakota Senate, before being elected Attorney General in 2000. Rosemarie Myrdal represented District 11 (Pembina and Walsh counties) in the North Dakota House from 1985 until 1993 and served as the Lieutenant Governor of North Dakota from 1993 until 2001.